Airbus has flown through structural testing on the panels of its new A350 passenger jet thanks to sophisticated computer modeling software developed by a Skolkovo resident. The European plane-maker is set to roll out a fleet of A350 XWB later this year, with Qatar Airways the launch client. Russian tech firm DATADVANCE produced the MACROS software platform that reduces dependence on expensive and time-consuming physical testing. Airbus engineers performed strength tests on the plane’s composite panels using pSeven in just a few hours, where physical testing takes much longer, DATADVANCE said in a statement. Airbus bills the A350 XWB, which stands for “extra-wide body” as unique, due to its carbon-fiber fuselage. Existing passenger jets have metallic fuselages. 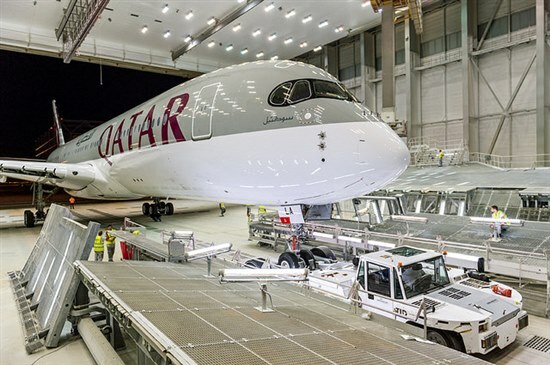 Qatar Airways is to receive the first of 80 aircraft by year-end. DATADVANCE, a joint venture company between EADS and Russian partners, is a resident of Skolkovo’s IT Cluster. It specializes in in the development of software for predictive modeling, intellectual data analysis and multi-disciplinary optimization. MACROS – its flagship product – is the result of close cooperation with the Institute for Information Transmission Problems of Russian Academy of Sciences, one of the leading mathematical centers in Russia.